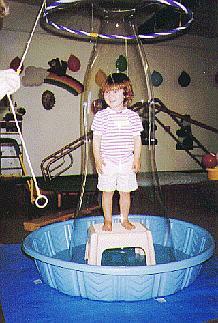 For Wee Workout's 7th Birthday in 1991, I created our Bubble Machine. My husband was so impressed that he wanted everyone to be able to share our fun. He contacted our local TV station and our County Newspaper in hopes that someone would respond. The Telegram Tribune did! A photographer came out to Wee Workout and shot several rolls of film on just one 2 1/2 year old class! 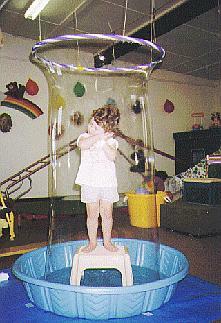 The following Thursday, low and behold, Tommy, with his totally amazed look inside the bubble, appeared on the entire front page of the Tribune. 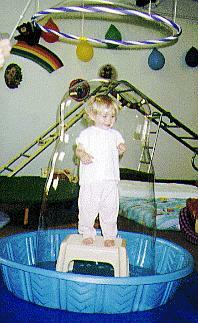 Over the years, we have taken many dozens of pictures of children thoroughly enjoying being in the big bubble. We would like to share some of these pictures with you. Enjoy!